Please refer to the NEW Webelos Handbook to track the requirements for earning the Arrow of Light, Cub Scouting's highest award, which is earned in the second year of the Webelos program. The handbook can be found at the Scout Shop, or online at www.scoutstuff.org. 3. Complete three Webelos elective adventures of your den or family's choosing. *Requirement 4 of the Arrow of Light Award, Requirement 4 of the Webelos Badge, and the Youth Protection requirement from the Bobcat Badge are the same. 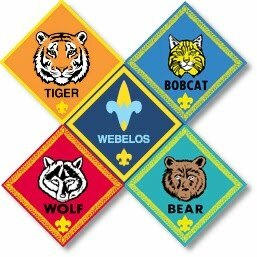 If a Cub Scout earns his Bobcat rank during the same year that he begins working on his Webelos or Arrow of Light Award, ne needs to complete the requirement only one time. **If your family does not have Internet access at home AND you do not have ready Internet access at school or another public place or via a mobile device, the Cyber Chip portion of this requirement may be waived by your parent or guardian. Show how to tie a bowline. Explain when the knot should be used and why. Teach it to another Scout who is not a Webelos Scout. Demonstrate your knowledge of the pocketknife safety rules and the pocketknife pledge. Earn your Whittling Chip card if you have not already done so.